A short History of the Ross Revenge. She was built in Bremerhaven, Germany, in 1960 as one of three similar vessels and christened "Freyr", registration "RE1". 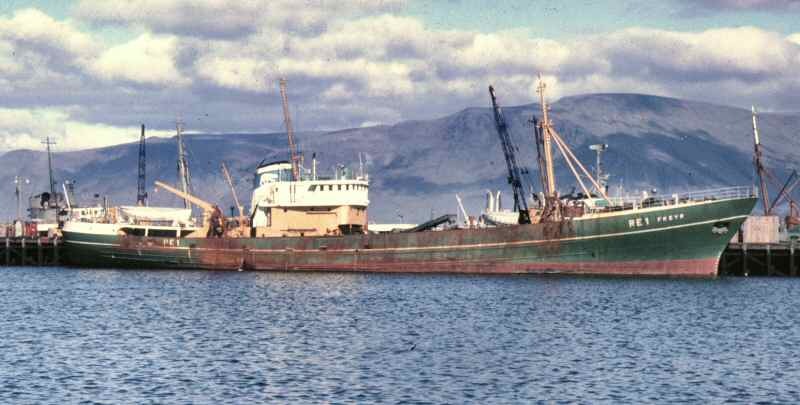 Known from that time on as a "super trawler", she and her two sisters were believed to be the largest side trawlers to be built anywhere in the world. With a 2000HP main engine, vari-pitch propeller, vulcan fluid transmission coupling and many other technologies never before seen on a trawler, these ships were built to work hard. The Freyr and her sisters "Vikingur" AK100 and "Sigurnur" IS33 all went to Icelandic fishing companies. 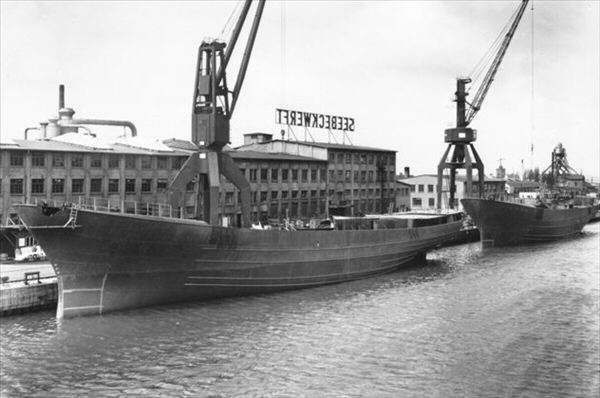 With ice breaking strengthend bows, dual sided fishing gear, immense cargo holds with a 6 metre draft and deep water long range capability these ships meant business. Some time later, a very similar fourth ship "Mai" (GK346), with a few minor alterations but a different engine was built at a different yard in Bremerhaven. The story is that her owners found problems getting her into and out of Reykjavik harbour on all but the most favourable of tides, and just three years after she was commissioned they put her up for sale. 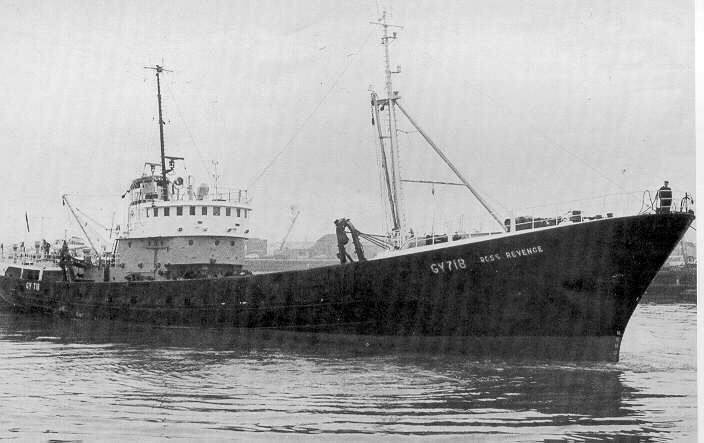 On 3rd Sepetember 1963 she sailed to her new home port of Grimbsy on the east coast of England where her new owners Ross Fisheres renamed her "Ross Revenge", registration GY718. 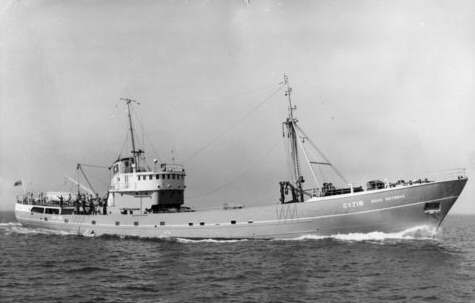 In her new home she became the "mother ship" of the UK's long range fishing fleet and operated on voyages of two or three weeks duration to Icelandic and Northern Arctic waters. Her formidable strength, power and agility were key factors in her ability to operate in waters as low as -20 degrees centigrade, where extensive catches of cod and herring could be found. For the next decade was making the record books for the size of loads she was bringing home - a single trip could net as much as £77,000 of fish when sold at market at a time when a new house cost £15,000. 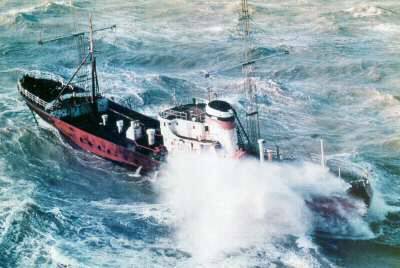 However, seeing many foreign ships depleting fish stocks around their homeland the Icelandic government started to introduce and police its territorial limits and the so called "Cod Wars" broke out. The Ross Revenge amongst many other UK ships was frequently challenged by Icelandic Navy gunboats who attempted to intercept her and either inspect her catch or cut through her nets. On more than one occasion tempers flared and accusations were levelled about attempts to ram other vessels. However, the Ross Revenge with such a powerful engine was known to be capable of outrunning many of the Icelandic navy ships, and her skipper of the time was notorious amongst the Icelandic coastguard for being somewhat of a challenge to their authority. By the late 1970's the London government along with many other European governments reluctantly accepted Icelands new 200 mile limit and with little stocks closer to home the long range fishing industry went into very sharp decline. Many of her contemporaries met with the cutters torch, whilst some went on to be converted for use in the then booming North Sea oil industry. 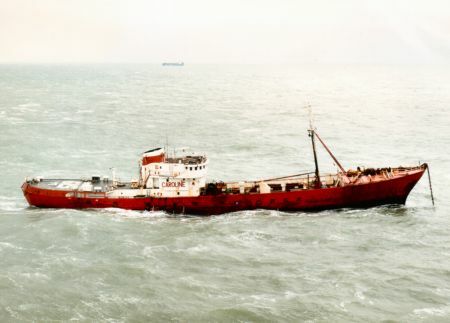 However, The Ross Revenge laid in port for almost two years before she was acquired for use as a salvage ship and tug to operate from the Cornish coast in 1979. By September 1980 she was laid up in Cairnryan shipyard on the West coast of Scotland where she assisted in bringing HMS Ark Royal into the breakers yard. It is possible that she was also facing the cutters torch at this time, just 20 years old, but this fact cannot at present be confirmed. Shortly after she was auctioned off by a bank and despite bids from several breakers yards, she went to a mysterious buyer for an undisclosed purpose. 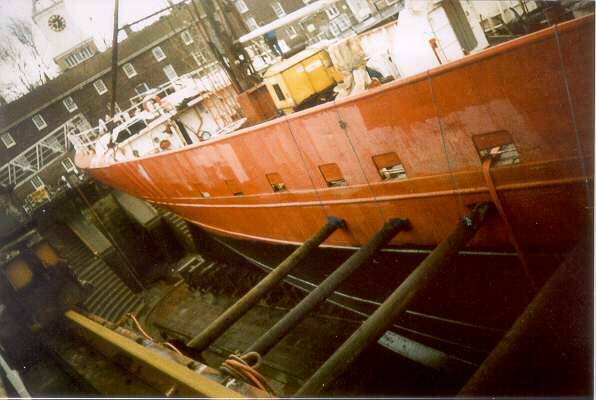 She was taken to Santander in Spain where conversion work started to turn her into the new Radio Caroline ship, replacing their former ship "Mi Amigo" which had sunk at anchor during storms following a 20 year broadcasting career. Financial and legal disputes delayed the conversion process but finally, in August 1983 she left Santander and headed for the Thames estuary. On 20th August, with an immense 300 foot transmission mast and brightly repainted in red and white the Ross Revenge entered the history books again as Radio Caroline re-launched to a pan European audience. 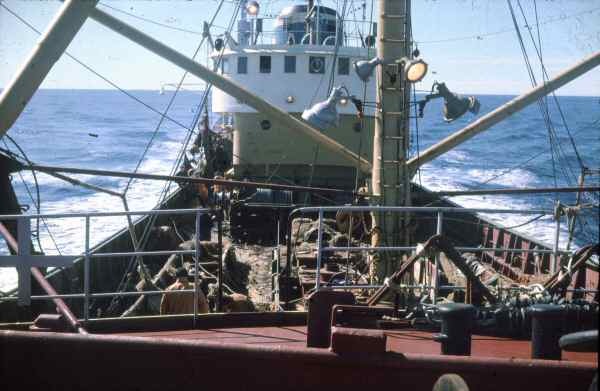 Keeping a radio ship at anchor is no easy task and as early as January 1984 she dragged anchor and had to be towed back to her normal anchorage in the Knock Deep channel safely outside the UK's 3 mile territorial limit. Broadcasts resumed shortly after taking up anchor again, and over the next few years she held up well in her new career, for a while hosting three separate radio stations on three frequencies - an accomplishment never before or later achieved by an offshore station. However, the hurricane force winds which ravaged the southern UK in October 1987 (colloquially known as the "Michael Fish" hurricane after the TV weatherman mocked a viewer who asked if a hurricane was on its way) wrought damage upon her mast and its rigging - many of the lines had stretched and the ceramic insulators used to stop her transmitter power shorting back to the deck had shattered under the immense strain. Remarkably though, that morning after the hurricane she was one of only a handful of radio stations in the South East to be broadcasting. But the mast was critically damaged, and without effective support it started to flex and metal fatigue at the base started to set in. Before repairs could be effected, north easterly force 10's a few weeks later ravished the ship once more, and in the early hours of the morning of 25th November, as the tide changed and the ship swung round there was an almighty cacophony of bangs and crashes as the mast collapsed over the starboard side of the ship, still held in place by the remaining guy wires. 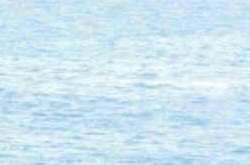 The terrified crew spent the remainder of that stormy night in life jackets and ready to abandon ship as she sat at a precarious angle with the remains of the mast crashing and banging against the hull as one by one the stay wires let go. Finally, at first light the winds had sedated just a little and the ships engineers ventured out onto the deck with cutting torch and grinders and the tower of power was forever laid to the bottom of the North Sea. Although back on air within a number of weeks using a make shift antenna, the signal was weak and coverage was poor. Throughout 1988 various temporary and experimental antennas were tried, but it was not until early 1989 that two strong fixed masts were assembled at the front and rear of the ship, thus allowing a new central mast to be built later if and when the finance became available. By the summer of 1989 things were looking brighter, the three services were back on air, coverage was improving, and supplies were reaching the ship. However, in official circles plans were being made to thwart this latest return of Caroline by any means. On the 19th of August 1989, literally out of the blue, in the international waters of the North Sea, a large Dutch tug pulled up alongside the ship crewed by representatives of the Dutch government and a small army of "heavies". Behind it came a boat chartered by the British government. Just after 1pm that afternoon the transmitters of the Ross Revnege fell silent and over the next ten hours a government sponsored wrecking spree took place on the ship where all of her broadcast equipment and much more was forcibly removed or smashed into irrepairable pieces. By the time boats chartered by journalists got out to the scene the destruction was over, and the saboteurs were making their way home. Although once again, Caroline returned from this critical wound, it was to be the begnning of the end. Throughout the next 12 months money became scarce, supply tenders became fewer and far between and the stations solitary signal was jammed, but it was the 1990 Broadcasting Act which was the final nail in the coffin. Having learnt from the outcome of the raid in 1989 this new legislation granted the Britsh government the power to board any ship, broadcasting anywhere in the world and take whatever steps were necessary to prevent its broadcasts being heard in the UK. No government anywhere in the world has the authority to grant such extra-territorial powers to itself, but the only way to prove such jurisdiction was to take a test case to the highest international courts. A vastly expensive and lengthy process. 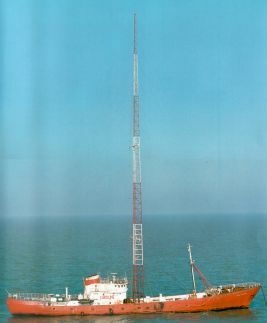 The last broadcast from Radio Caroline in international waters was in November 1990 and throughout 1991 the Ross Revenge remained at anchor manned by a caretaker crew, whilst the lawyers investigated ways to continue. North Easterly gales in November of 1991 however put an end to any chance of another triumphant return. Battered and bruised and without power she was dragged from her anchorage and drifted 17 miles until running aground on the notorious Goodwin Sands. In the early light of the morning her crew was helicoptered off and she was left alone to succumb to nature. Over the years hundreds of ships and thousands of lives have been taken by the Goodwin Sands and for a while it looked as if Ross Revenge was destined to become another one. However, she is a remarkable ship, and after four days effort by two tugs she was recovered and taken into Dover Harbour where she was promptly arrested and served with a detention order. Surveyed shortly afterwards she was subject to a 38 page list of defects and described as the most unseaworthy vessel ever seen. However, Caroline supporters were not deterred by such officialdom and by coming together to form a support group they raised money to pay the salvage costs and cover the most critical defects. Since 1991 Ross Revenge has been cared for and maintained by an enthusiastic supporters group, who not only have covered the costs to operate, preserve and restore her, but have also rasied the finance to re-launch Radio Caroline as a 21st century worldwide internet and satellite radio station like no other. 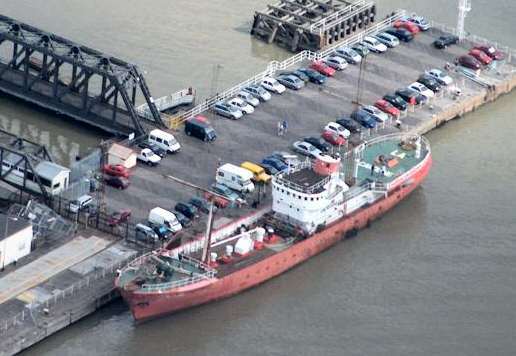 Once released from Dover, but still subject to a detention order the Ross Revenge has been taken round various locations in the Thames estuary. Southend Pier, Clacton, Bradwell, London Docklands, Sheerness, Rochester, Queenborough and most recently Tilbury have provided temporary homes for the old girl whilst allowing her to be opened up to the public as a real life, living, floating museum with an amazing story to tell - from icebergs in the arctic to records at sea. This Site (C), Launched July 13th 2001.